It’s the spookiest month of the year, and today I’m bringing you a wide range of Halloween novels–from witchy to chilling to bloody. 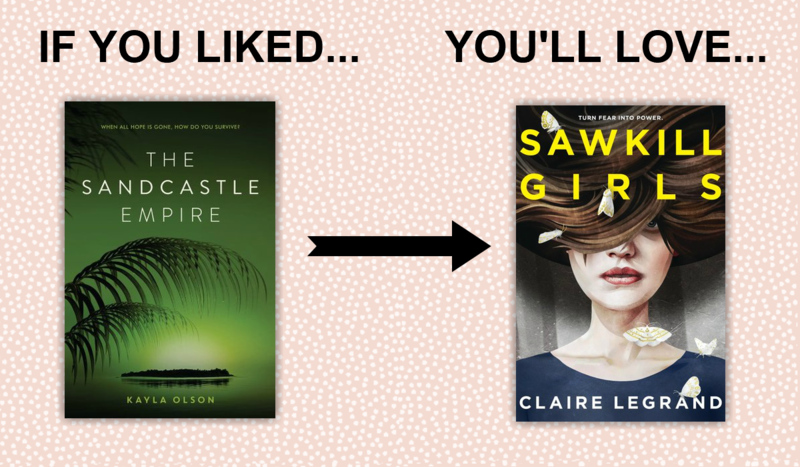 These are sure to suit your every taste–whether you do or do not like horror–and provide a large variety of awesome book recommendations based on novels you already know and love! From spooky islands to infected people to devils and witches and mysterious households galore, you’ll be able to find a perfect read to get you in the mood for this month’s spooky nature! If you liked This Mortal Coil, then you’ll love Devils Unto Dust! I know you’re looking at me like I’m crazy–dystopian science-fiction similar to western apocalyptic horror? Never! That’s right–both feature really spine-chilling tales of infected people and disease and zombie-adjacent infections and it’s hella freaky. They’re both a little gory (I mean–you’ve seen Emma’s Twitter profile picture, right?) and a whole lot of fun with their grim worlds of infection. 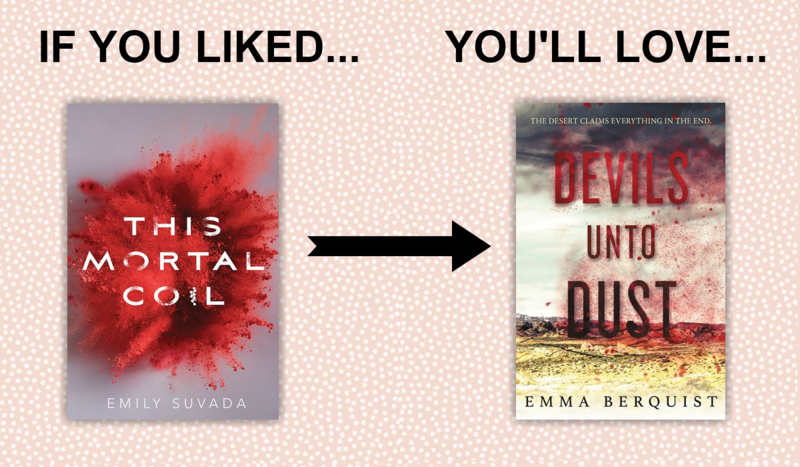 And both deal a little with science, although one obviously more than the other, and I can’t spoil things for you, but know that there’s a relationship and you definitely want to check out Emma Berquist’s Devil Unto Dust if you like the whole people-blowing-up-into-plumes-of-infectious-mist from Emily Suvada’s This Mortal Coil! If you liked The Price Guide to the Occult, you’ll love The Wicked Deep! I mean, first off, WITCHES. 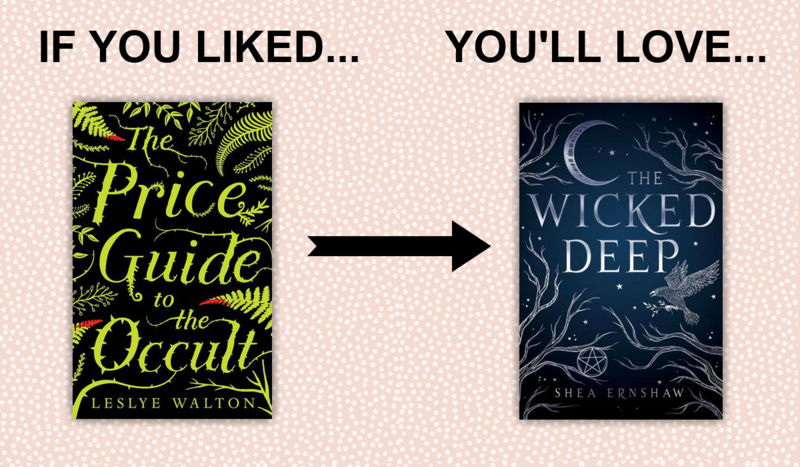 We love witches–good, bad, morally gray, and everything in between. The witches honestly just add to the atmosphere in both of these. But even further than that, the main characters in each (no spoilers though!) struggle with right and wrong and I really enjoyed this about both books! Plus, once again, both atomspheres are top notch and bound to get you in the mood for the spooky season! 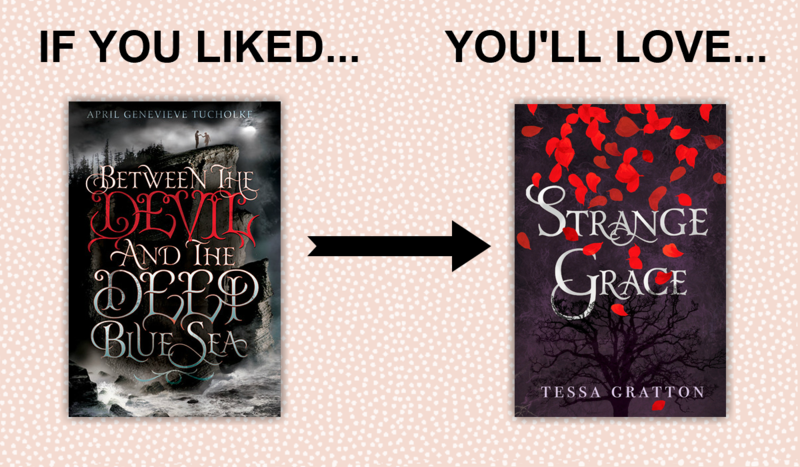 If you liked Between the Devil and the Deep Blue Sea, you’ll love Strange Grace! Okay, I admit that I actually haven’t read either of these, and my recommendation could be totally off on this (so if you wanna corroborate/deny this correlation, please let me know! I could use all the input!). But both of them mention devils, so that’s already a good start to a solid correlation! And they both weave romance and horror together into what’s hopefully a chilling combination! I’m definitely very excited to read both of these and they look like they have an amazing atmosphere as a backdrop of an enticing plot! 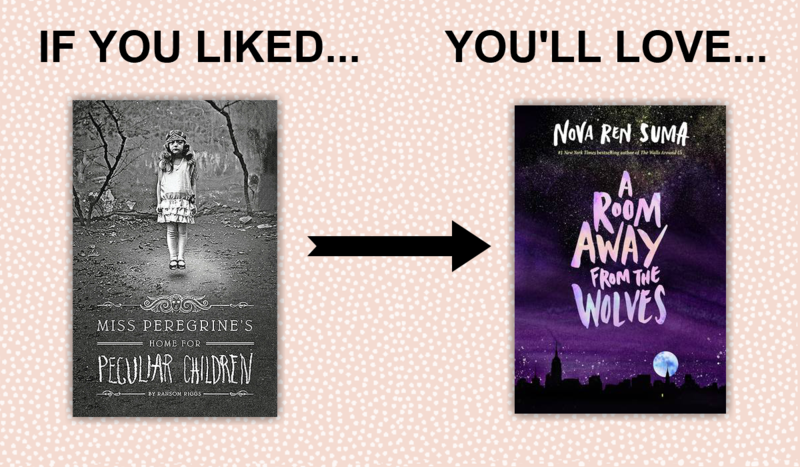 If you liked Miss Peregrine’s Home for Peculiar Children, then you’ll love A Room Away from the Wolves! I thought my comparison between Miss Peregrine’s and The Dark Beneath the Ice was good, but really, I should have done Miss Peregrine’s Home for Peculiar Children and A Room Away From the Wolves. Because Suma’s novel has so many similar elements–the mysterious home for girls vs. mysterious home for peculiar children, strange happenings throughout the home, and a chilling contemporary atmosphere! Both books feel very measured in the way Riggs and Suma plot the novels out, and I really like how you can tell the plotting and deliberation that went into all aspects of each book, which is ultimately why I made this comparison! The writing styles felt similar to me, and I definitely enjoyed both of them! If you liked The Sandcastle Empire, you’ll love Sawkill Girls! Okay, so I haven’t had a chance to pick up Sawkill Girls yet, but both The Sandcastle Empire and Sawkill Girls take place on an island, so that’s already one solid correlation…right? Fine. You don’t believe me? Then how about how both are very atmospheric–one in a you’re-gonna-die tropical-island near-future dystopia, and the other in a wooded monsters-are-hiding-in-the-forest island fantasy! Both are super cool atmospheres and chilling enough to get you in the mood for Halloween! And then also the theme of girls fighting back! Like, omg yes I am here for this female action! I adored all the female power in The Sandcastle Empire, and am sure Sawkill Girls will also pull through with strong female protagonists! Also, check out The Dark Beneath the Ice (which I’ve actually referenced in one of my August 2018 post) and Not Even Bones & What the Woods Keep (from my September 2018 post)! Which spooky books do you love & are excited for? I keep seeing Strange Grace everywhere lately, and I totally need the constant reminder, haha. omg ahaha yes! I need to read it, I’ve definitely heard good things about it. and thank you!!! Awesome post! I can’t wait to read some of these, especially Sawkill Girls. ahhh thank you so much! me too! sawkill girls sounds amazing and I can’t wait to read! I’ve gotta read Strange Grace now!!! it’s really cool–I love the near future dystopia Olson writes in The Sandcastle Empire and definitely recommend!! Thank you! And me too–it sounds awesome and I’m excited! I love these posts of yours so much, checking out Devils Unto Dust and Between the Devil and the Deep Blue Sea now! Ahhh, thank you so much, Kaleena! and yes omg you need those so badly!! !